The picture above is for a 2400 model and contains options that may not be available on all the TMS Models. See <Model Comparison> for available options on each PVR. The Portal is a set of add-on "smart apps" available through a single interface: a software application separate to the firmware1 that is launched when you select this option. The Portal requires an Internet connection as all the 'smart apps' are Internet based. There is further discussion of the TVPortal elswhere. 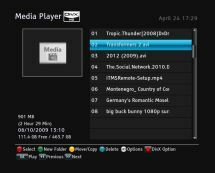 The Media Player takes you to a file browser of the Media folder. 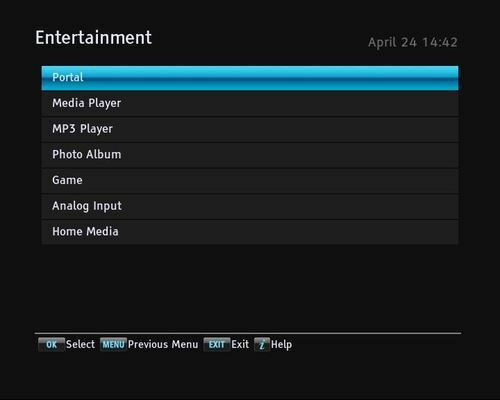 You will then be able to select and play any media files that you have uploaded to the PVR. The MP3 Player takes you to a file browser of the MP3 folder. 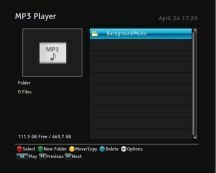 You will then be able to select and play any MP3 files that you have uploaded to the PVR. 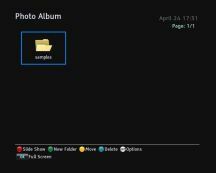 The Photo Album option takes you to a file browser of the Photo folder. 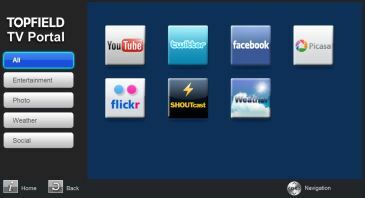 You will then be able to select and play any image files that you have uploaded to the PVR. Selecting the Game option starts the Battletank game. If you have replaced your internal HDD the game will not work; you will have to 'recover' it using the BTinstaller TAP; see discussion in 'when things go wrong' setction. 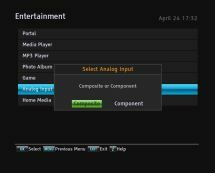 Selecting the Analog Input enables the viewing of video via the Analog Input connections. Selecting Home Media takes you to the menus to configure and use Home Media, aka DLNA. DLNA is a way to serve and playback media to/from your home network. For example, once you setup your PVR as a Media Server, other devices on your home network that have a DLNA (or UPnP) client can browse and play media files from the PVR. Likewise, if other devices on your home network are setup as DLNA Media Servers then the PVR can find these and playback content. 1. It is separate to the firmware in the TRF-2400/TRF-2460 and involves a separate download. In the TF-T6000 a separate download is not needed.